At two Michigan prisons, a new program is showing inmates they have what it takes to learn a trade and still be able to make something of their lives. For many, it’s a hand up and a way out of the cycle of crime and punishment. Called Vocational Village, the program is the first in the nation that teaches inmates professional trade skills. Upon graduating from their respective programs, the inmates are certified or otherwise credentialed, which positions them to get a better job once they are paroled. The program is not only giving inmates a second chance, it is helping the construction industry by providing a new pool of trained and skilled workers, eager to earn a decent living in their construction trade. Michigan Construction partners with Vocational Village sharing resumes and making connections to employers for Vocational Village trainees seeking a career in construction. The first Vocational Village began operation in 2016 at the Richard A. Handlon Correctional Facility in Ionia. The second opened in August 2017 at the Parnell Correctional Facility in Jackson. Among the programs offered are four construction-related programs: carpentry, plumbing, electrical, masonry/concrete and truck driver. Concrete/masonry, carpentry and truck driving are offered at the Jackson campus, and carpentry, electrical, and plumbing are available at the Ionia campus. Each program uses the National Center for Career Education and Research (NCCER) certification curriculum. Housed together like in a college dorm, the inmates are immersed in their training and being with others like themselves who are aiming for a fresh start as a re-entering citizen. They work and train as if on a regular workday schedule and spend off hours together for studying, fine-tuning their skills and planning their future. At full capacity, the Handlon campus can accommodate 165 vocational trade students, 27 vocational trade tutors and 12 building trade workers. The Jackson campus has the capacity to accept 240 prisoners into the program, with an additional 32 inmate tutors and 85 Pell Grant tutors. During a recent visit to the new Jackson facility, Michigan Construction Foundation’s Executive Director Brindley Byrd said that, although the program is still young, it appears to be off to a great start. 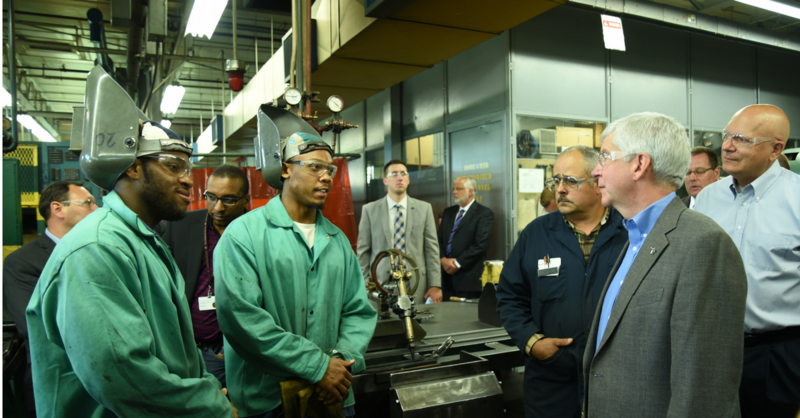 Michigan Governor Rick Snyder also visited the newly opened Jackson campus recently and was equally gratified to see how enthusiastic everyone is about Vocational Village and about the prospects for the inmates who complete their training. The state also works hard to make sure the trained parolees get a job as soon as possible after leaving prison— or even before. To do this they first pair the aptitudes and interests of the inmates with the professional trades that are in demand in the counties they will return to when released. Next, they actively work to engage area employers who have a need for trained workers in those trades. Another helpful step students can take to enhance their employability is to take the ACT WorkKeys readiness test that assesses real-world skills employers feel are essential to the job. Passing the test gives the student nationally recognized certification in workforce readiness. Though still in its infancy, the program is on its way to showing the nation how business and government can work together to change lives and fill workforce voids—something the construction industry can benefit from more than most. To learn more about the movement to build a better Michigan, visit our Partner Hub.